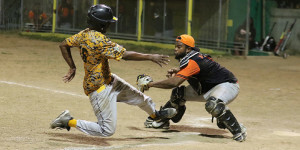 After overcoming two four run deficits—one in the first the other in the third inning—defending champions Pirates have taken a commanding 3-1 lead in the best of seven BVI Softball Association Juliette Penn League Championships Series with a 12-8 victory over Power Outage, that came early on Monday morning. Allen “Woodrow” Smith was the winning pitcher and Power Outage’s Dariel Robinson took the loss. Smith said coming off Saturday night’s 9-2 victory in which he scattered four hits, he had to pace himself because his body wasn’t fully recovered. Power Outage manager Keno Gumbs noted that his team that saw Jeremy Penn lining a 2-run shot over the center field wall off Smith as part of a 4-0 advantage in the top of the first inning, couldn’t keep the momentum. Gumbs said while they wanted to even the series heading into game five, they know they must win on Friday to extend the series. That’s Your Problem avoided being swept by the Hawks in the Women’s Division, following a 9-7 victory. They trail in the series 3-1 and will try to stave off elimination on Saturday.